Don Grundmann has long been a mainstay for more than a decade on nearly every June primary ballot in Alameda County since 2000. The San Leandro chiropractor, however, has never managed to advance to the November General Election. This year, his campaign as an independent candidate for the U.S. Senate, will offer more of the same. But what’s different is Grundmann’s inclusion of some of the most abhorrent views perhaps ever included in a statewide ballot statement. Grundmann used his allotted 250 words in the statewide voter guide to issue a stunning anti-transgender screed as the basis for asking voters for their support, as first reported by The Advocate. This sentiments does not appear to have been raised by Grundmann during his many previous runs for public office. Grundmann’s ballot statement during the 2016 June primary merely noted his website. However, in a video from Grundmann’s 2008 campaign for the San Leandro school board, he expressed alarm over the creation of a Gay/Straight Alliance club at a local elementary school. While Grundmann’s current website features an image of Caitlyn Jenner posing on the cover of Vanity Fair with the tagline: “They will start recruiting your children in Kindergarten,” the majority of the site focuses on his vow to dismantle the Internal Revenue Service and the U.S. Department of Treasury. As The Advocate noted, this type of rhetoric is not forbidden by state law, except in one particular case. If the candidate writes a disparaging remark about an opponent in the race. 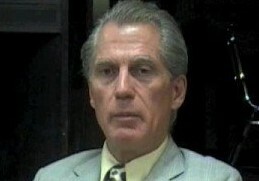 Grundmann has run for the House of Representatives, U.S. Senate and President in 2008. Only in 2014 did he not appear on the ballot in Alameda County. 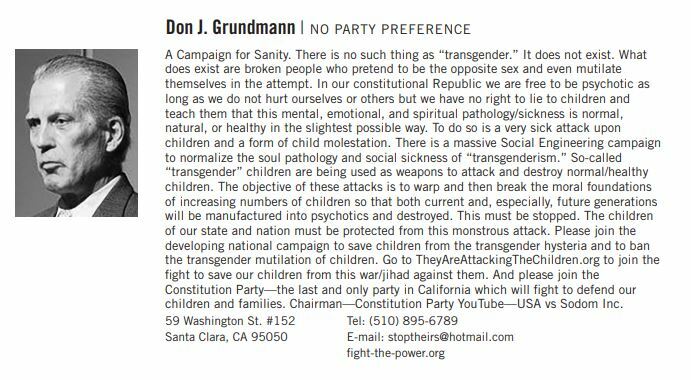 Posted in ballot statement, Don Grundmann, June primary, san leandro, transgender, U.S. Senate. Bookmark the permalink.